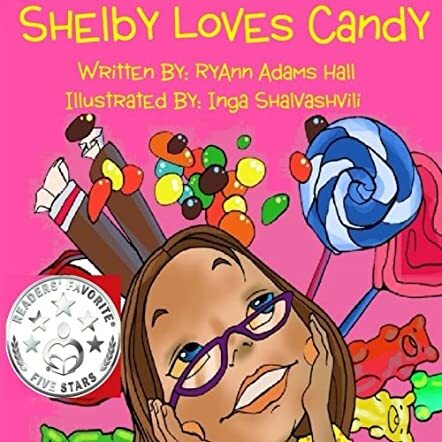 Shelby Loves Candy by Mrs RyAnn Adams Hall is an adorable story of a little girl who loves candy more than anything else in the world. Shelby loves all types of candy, lollipops, gumdrops, gummy bears, jellybeans, tootsie rolls and anything that is candy. She has candy after breakfast, lunch and dinner. She doesn't mind having candy in her sleep too. Shelby has to take good care of her teeth as she is eating so much candy. She discovers that fruits are also as sweet as candy but healthier and better for the body, mind and teeth. It's a good book for kids to introduce them to healthy eating habits. The illustrations are bright and colorful and breathe life, movement and color into the story and scenes. It's a good bedtime story book for parents and grandparents to read out to their kids and grandkids at night. The book can also be used for read aloud sessions in classrooms and school libraries. The message conveyed through the story is good for kids to incorporate into their eating habits. The teeth brushing habit and looking after teeth is also something that is important for kids to know. The book encourages healthy habits in kids. Books with a good concept and message are good for children as it makes teaching easier. Kids will love this colorful book filled with adorable pictures of Shelby and her candies. The book covers many educational topics for kids.